Anchor Marine Repair is known for our comprehensive boat repair services. Even though most of our repair services are offered to boat owners in the central Minnesota and Western Wisconsin area, we have also worked on boats transported to us from much farther away. Not all boat repair companies can make such a claim. But we can—our commitment to excellent customer service and our professional knowledge has resulted in a positive and widespread reputation. Our customers understand that we have the experience and expertise to repair virtually any issue with their boats. What may separate us from our competitors is that we also repair boats fast. At Anchor Marine Repair, fast repair NEVER means sub-par repair. We are able to complete your boat’s repairs fast because we know what we are doing and we have a large state of the art facility so that we can get to your boat fast. Our knowledge and experience combine to create a unique problem-solving-oriented business culture. We apply critical thinking skills to your boat’s issues drawing from our vast database of repair knowledge and get to work. 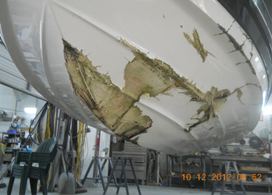 Your boat may have significant structural damage or it may have motor or transom damage. You might have struck an obstacle that created a large gash in the hull, and you quickly realize you would not be able to repair it yourself. This kind of damage, however, is not necessarily a complicated fix for our team. We have the tools, the experience and the facility to make this repair quickly so that you can minimize repair time and maximize your time on the water. Our team also understand that boat owners take pride in their possession. If the repairs you need are more cosmetic in nature, and require matching paint or stain colors, we have the means to return the aesthetics of your boat to its original condition. This business value is probably best expressed in our wood floor refinishing service and metal flake repair. 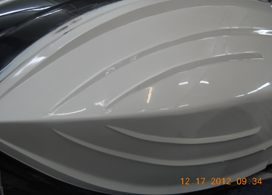 Restoring your boat’s appearance will require a finer touch, and our experience allows us to complete even the most subtle and nuanced work in a speedy fashion. Finally, you can be confident that we never sacrifice quality of work. Your boat is a very important possession and a significant investment. We know you want to get it back on the water as soon as possible, which is the main reason we have worked hard to develop repair efficiency and offer only the highest quality repair work. No matter what kind of boat you own, and no matter what kind of repairs it needs, Anchor Marine can do the job and do it quickly. You can contact us at 763-972-3540 or service@anchormarinerepair.com.